Bathroom decor which emphasizes the crystalline beauty of glass is a popular trend, and it all started with the invention of the frameless shower enclosure. Adding extra glass elements can open up and modernize any bathroom space. If your bathroom has an exterior wall consider installing more windows to let in as much natural light as possible. Also, consider adding glass-fronted cabinets. These are the perfect choice to sit beside your standalone glass-walled shower stall. There is something about seeing stacks of pure white fluffy towels, dishes of soap, candles, and jars and bottles of pomades, perfumes, and shampoos which can make a bather feel as though they’ve entered a spa. Why hide all your pretty items behind wooden doors, nothing showcases objects better than glass. Glass-fronted cabinets come in a variety of designs. With a classic bathroom they can resemble the cabinets you might find in the more formal areas of your house. These classic-inspired cabinets might have diamond-paned glass, something you might find on a library case which holds rare books or a dining room cabinet stacked with silver and china. This type of cabinetry fits well with a mini-chandelier and elegant woodwork in glossy white. If you are looking for opulence, then consider display cases filled with precious statuary and other breakable objects. Glass-fronted cabinets which look more utilitarian or resemble antique curio cabinets or apothecary shelves are perfect for a streamlined modern bathroom or a retro-inspired decor. Frosted, rippled, bottle-base glass, stained glass, or art glass can all add interest. 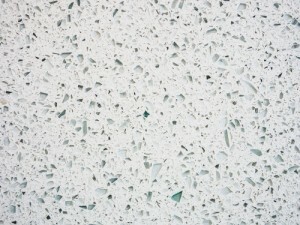 Recycled glass countertops are another innovative way to add glass to your bathroom. These highly-reflective surfaces paired with glass cabinetry and glass shelving and a frameless shower enclosure can give your bathroom a sleek and shiny look. Besides being beautiful these countertops are green, as in eco-friendly green. Those bottles and jars which you throw in your recycling bin might very well end up in one of these shiny countertops. Glass countertops are made from resin or concrete and the glass pieces are embedded in the binding material. All the glass used is from recycled sources. Like countertops of natural stone you can buy glass countertops in neutral shades. 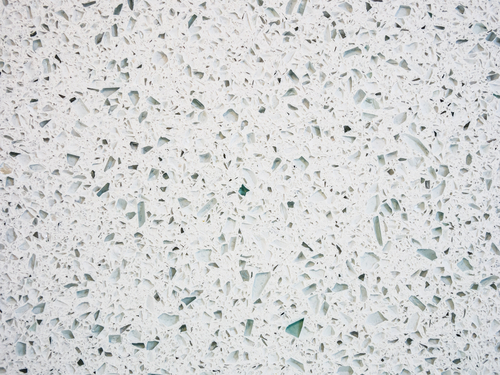 But with recycled glass countertops you can go beyond neutral, to vibrant, bright shades. Glass countertops are manufactured in a variety of colors. You can have a mix of chips, ruby red and black for instance or cobalt blue and gray or even a confetti color scheme with a mix of bright colors. You really can’t go wrong with more glass in your bathroom decor. It’s a versatile and easy to clean surface which can both brighten or lighten your bathroom. For some remodeling or redecorating inspiration, stroll through our Dallas showroom to see the wonder of glass on display.